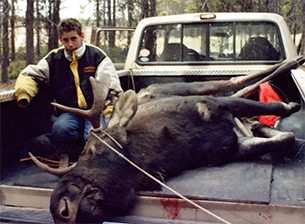 My dad took me moose hunting and we caught this moose. My dad says he is not very big, but he sure is big to me. I have never seen a big moose like this. My dad is wrong I think. He is much bigger than I am. This was a very exciting hunting trip and I want to go again. Next time I can maybe shoot the Bull Moose. Looks like you did get your turn. Nice job.